The Primate of All Ireland has expressed concern over the impact of the ongoing political and economic uncertainty over Brexit. 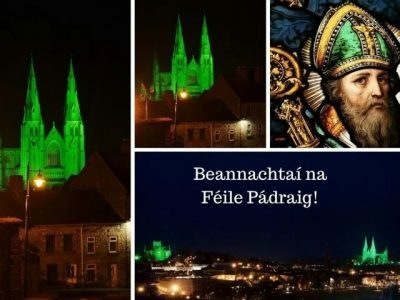 In his message to the people of Ireland at home and abroad for St Patrick’s Day, Archbishop Eamon Martin of Armagh underlined that the “relationships within these islands are becoming more strained and fragile”. He said families across the island of Ireland – including those who live and work along the border and those who make their living from farming, business and haulage – had expressed anxiety to him about what the future might hold. Nobel Peace Laureate, John Hume, “one of the great architects of our peace process” had spoken of the border not simply as a line on a map, but as the institutionalised division that can exist for centuries “in hearts and minds,” he recalled. Of the country’s patron saint, he said St Patrick during his ministry was not afraid to speak up strongly for the dignity of the human person. “He was a champion for dialogue and for the peaceful resolution of problems. He offered friendship and forgiveness to his former captors and even to the corrupt slave-trader, Coroticus, who attacked his newly-baptised converts. Archbishop Martin, and his Church of Ireland counterpart, Archbishop Richard Clarke, will take part in a special family celebration for St Patrick’s Day from 12.15pm – 12.45pm in The Shambles Market area of Armagh, situated between the two cathedrals. The Primates of All-Ireland will be joined by representatives of other Christian denominations.